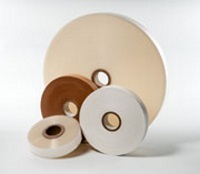 Brown stock banding paper tape for the OB-360 banding machine. It's dimensions are 110 micron thickness, 30mm width, and 3280ft length per coil. Each case contains 10 coils.